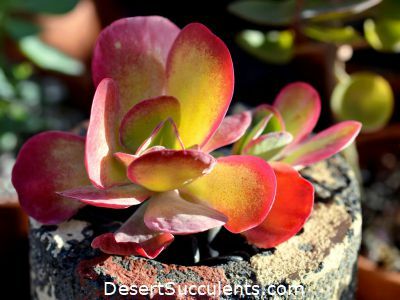 The Kalanchoe ‘Fantastic’, Kalanchoe luciae, is a colorful easy to grow succulent. ‘Fantastic’ is a cultivar of Kalanchoe luciae. The leaves give this wonderful plant a special look that some would call cute. The leaves are a light gray-green but with splashes of red highlights. Depending on the environment they are grown in the leaves can have a bright red border all along the edges. More intense hues are produced in cooler temperatures which makes the Kalancho ‘Fantastic’ a favorite office plant. The leaves are shaped somewhat like a clam shell about 2-5 inches wide and 4-6 inches long. Some people describe the leaves as looking like paddles. This is a bold colorful succulent that also looks great combined with other plants. Pot Size: These do best in small and medium sized pots. Uses: These are grown outdoors with great success but are most often used in homes and offices. It fits in well with other xeriscaping plants outdoors. Light: Full sun to partial shade. The Kalanchoe ‘Fantastic’ is among the plants that thrive in artificial light so it works well as a houseplant or in an office. Soil: Any all-purpose cactus potting soil will work well. Flowers: In early spring produces tubular pale yellow flowers on a single stem. Water: Do not overwater. Water these plants only when they have dried out completely. Propagation: The Kalanchoe ‘Fantastic’ has a patent so it should not be propagated without the permission of the patent holder. The entire plant is poisonous if ingested. The Kalanchoe ‘Fantastic’ still has an active patent. The Kalanchoe luciae ‘Fantastic’ is very often misidentified and mislabeled as Kalanchoe thyrsiflora. The Kalanchoe luciae ‘Fantastic’ will attract hummingbirds.